I recently attended the wedding of our Bride-to-be Katie Ann Lamb. Having such an important celebration during pregnancy can present its own challenges, especially when it comes to picking an outfit. I was very fortunate for this occasion as I had the privilege of being the Maid of Honour, so my dress was picked for me! Luckily it was able to cope with a few small amendments around the waistline in order to accommodate the ever-growing bump. I have another wedding to attend when I will be nearly eight months pregnant and I will be scouring the shops for something that fits but also looks as stylish as possible come May – so stay tuned for that! One thing that I have learnt about attending special occasions when you are pregnant is that booking into a beauty salon before the big event can really help lift your spirits. There are so many body changes that happen when you are pregnant that you can get bogged down with some of the less desirable aspects, especially when you get to the point where your clothes don’t fit anymore and you start to notice weight gain all over! I also find that I am really lazy with beauty treatments at the moment and don’t seem to care too much about what I look like. However, when it comes to a wedding, it is important to try to look and feel your best, which is why I popped into Blush + Blow in Fulham for an MOT beforehand. 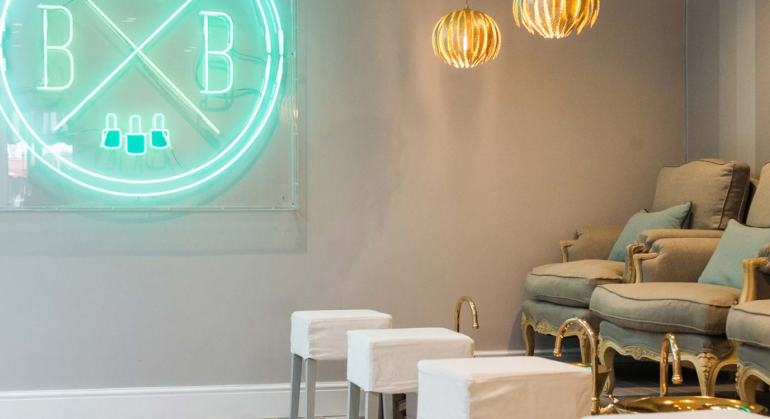 Blush + Blow was founded by Bridget O’Keeffe and this salon has been created to offer a range of treatments that are great value for money but also provide a lovely experience too. A resident in the local area, she felt that a fun and friendly beauty salon was missing and so has filled the gap – and done a great job in doing so! 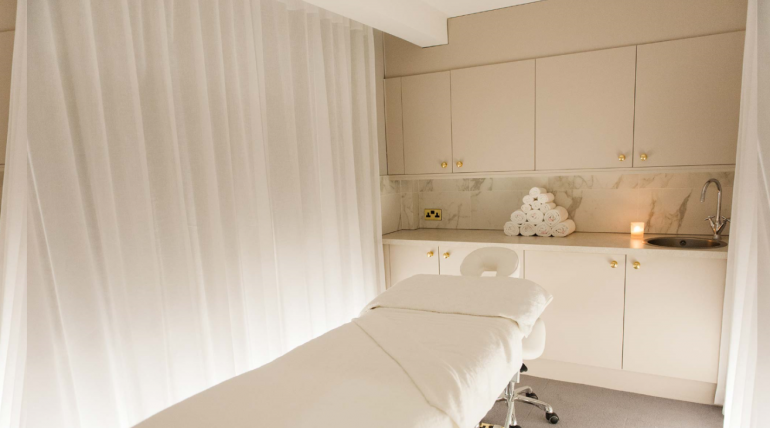 The salon in Parson’s Green has chic décor and the treatment rooms are located at lower ground level, which means you can unwind by enjoying the quiet and cosy atmosphere. I even managed to nod off during one of my treatments and I don’t think the pregnancy fatigue was the only factor at play. Rather, the setting is so relaxing that you find yourself quickly escaping reality and heading off into dreamland. Considering the name, it comes as no surprise that beauty treatments only form part of the menu and the other half focuses on hair, with Blow Dries a key offering. Blush + Blow caters for beauty, blow dry and skincare needs and I visited for some special attention to my eyes. During pregnancy, I have found lash extensions to be fantastic for a special occasion. They add so much to your eyes and really make them pop, without having to use too much makeup. In fact, you don’t even have to wear mascara anymore, so forgetting about doing your makeup during the months while you are expecting doesn’t matter a jot! Blush + Blow offer full sets of lash extensions and also a maintenance service too. I also had an eyebrow tidy and this salon provides tinting and shaping through the form of threading or waxing. I left Blush + Blow feeling wedding-ready thanks to these beauty top ups and would also recommend visiting for some of their other treatments if you want to indulge in a little TLC. In fact, Blush + Blow have a number of spring pamper packages on offer at the moment and these are great value. For £150 (normally £215) you can pop in for a facial, complimentary skincare product, Brazilian or Hollywood wax and a luxury pedicure! I can’t think of a better value package. There is also a special Mother’s Day Package, which includes a facial and a manicure for £100 (normally £135). I will definitely be taking advantage of this next year when Baby has arrived and it is a great gift for new mothers. There is a ‘Bambino’ area so mums can bring their little ones and they can play during their pamper session. Blush + Blow is also dog friendly, which will suit those with a fluffy ‘baby’ in tow.